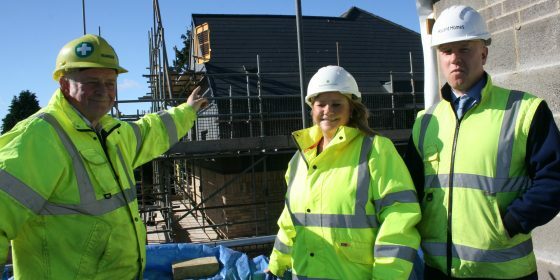 Work on award-winning house builder, Ascent Homes’ latest apartment development, currently under construction in Ponteland has reached a major milestone. Contractor, Surgo Construction has reached topping out stage out at Hemingway Court, the former Library site in central Ponteland. Raising the bar in apartment living within the town centre, Hemingway Court comprises 25 stylish one and two-bedroom apartments and penthouses. The new development also includes four Discount Market Sales Unit apartments to assist with affordability to Northumberland-based buyers who meet the eligibility criteria. Ascent Homes has received a high level of interest with several apartments already reserved. With excitement growing, the developer expects this interest to increase when an onsite sales office and show apartment opens later this year, giving customers an opportunity for a sneak peek into the highly anticipated development. Constructed over two blocks which are interconnected by a contemporary glazed bridge, the development replaces the former Ponteland Library building which was showing signs of deterioration and which was relocated due to Northumberland County Council’s rationalisation of libraries across the county. Working with a local firm of architects and the residents of nearby Henderson Court, Ascent Homes worked tirelessly to ensure that Hemingway Court would enhance rather than detract from its local surroundings. This has been achieved by the creative use of carefully selected materials and the introduction of landscaped grounds to include the planting of new trees along the Thornhill Road elevation of the site. Ascent Homes’ first apartment development, The Maltings, Alnwick, which has transformed a once derelict site in the heart of the town, has already received industry recognition winning the regional RICS Renaissance Award in the hotly-contested residential development category. Ascent Homes will now represent the North East in the national finals due to take place in London this November. In addition to Hemingway Court, the house builder currently has new homes either under construction or in for planning across sites in Alnwick, Ashington, Blyth and Ellington.